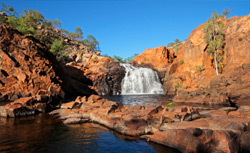 Oz Adventures launches new Three-Day Kakadu Safari In Style adventure tour for an unforgettable Australian experience. Australia and New Zealand gap year travel experts OzAdventures have continued their exciting adventure travel holiday offering into 2013 by launching the three-day Kakadu Safari in Style – an invigorating multiple stop-off tour comprising Australia’s timeless landscape of the Northern Territory taking in all the idyllic waterfalls, waterways and national parks along the way. This fulfilling three-day expedition is available at £539 per person boasting unbeatable value for what travellers will come to pack into an unforgettable 72 hours Down Under. The tour is overseen on behalf of loyal partner Adventure Tours meaning travellers can be assured of a quality adventure travel holidays package that includes Darwin, the Litchfield National Park and Twin Falls to name a few retreats. Boasting 18 years' experience within the industry, travellers will be greeted by enthusiastic and helpful guides who attend to your every need as the tour unfolds. For those that choose the self-confessed Kakadu Safari in Style for their adventure tours in Australia, they will start out in Darwin – named after the famous naturalist - and head south for the Litchfield National Park where the essence of style truly takes hold. Covering around 1500 sq. km, this region of Australia stretches for miles around and is blessed with some truly wondrous sights – none more spectacular than Florence Falls – just one of the numerous forces that reside in this part of the Northern Territory. As one would imagine, Australia possesses a hot climate so what better way to refresh one’s self than by a dip in the plunge pool amidst a paradise-like setting? After travellers reluctantly tear themselves away from this highlight of the tour, they will embark on an entirely different experience altogether in visiting the termite mounds that are prevalent within the park. Day two takes captivated tour members to Mary River where the sense of adventure builds steam. Travellers may lay back aboard a three hour cruise vessel that is bound for Kakadu where nature lovers will marvel at a plethora of awe-inspiring wildlife with birdlife, crocodiles and plant life which reside alongside Aboriginal lands whose own history can be told in greater detail at the Bowali Visitor Centre. The tour truly does have it all and it’s hard to think that so much can be packed into just three days. From natural streams, to lush rainforest to indoor exhibits, no one day is the same. What better way, then, to end your tour with OzAdventures by heroically riding in a four-wheel drive vehicle amidst the similarly picturesque region of Twin Falls? OzAdventures are there to ensure gap year students are entitled to such unforgettable experiences.